Over the last six months, we’ve been releasing research reports based on the results of our annual content marketing survey. Each one has focused on a specific vertical. Today we release B2B Enterprise Content Marketing 2016: Benchmarks, Budgets, and Trends—North America sponsored by Marketo. This report shows how B2B companies with over 1,000 employees approach content marketing. If you’ve read any of my blog posts about the prior reports, you know that a pattern emerged from our last round of research: Marketers reported lower overall effectiveness with content marketing compared with a year ago. The story is no different for enterprise marketers: Only 22% of enterprise marketers said their organizations are effective, down from 28% the previous year. Among all sizes of B2B companies we researched, it is the lowest effectiveness reported (30% of B2B marketers said they are effective). They’re on the same page – in their company, it is clear what content marketing success looks like. They communicate – they meet frequently to discuss their content marketing initiatives and extract value from those meetings. 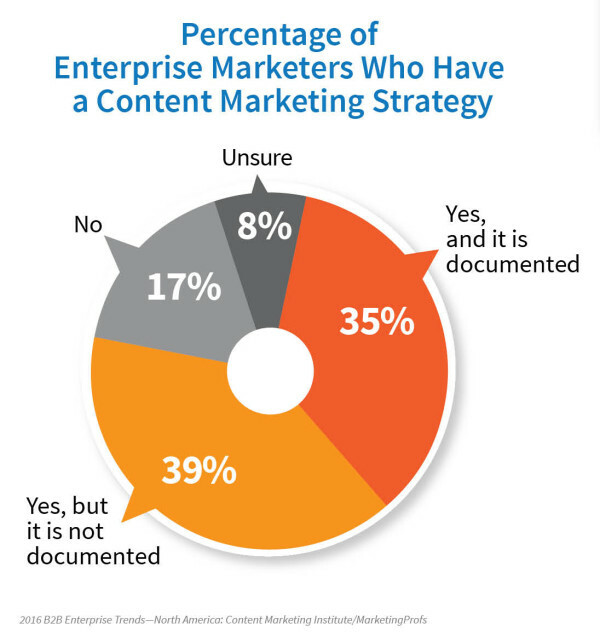 They have a map – a documented content marketing strategy is in place. They invest – the percentage of total marketing budget they allocate to content marketing is greater than it was last year. Certainly these marketers are doing many other things right, too, but let’s take a closer look at these four areas. It makes sense that you can’t be successful if you don’t know how your organization defines success. 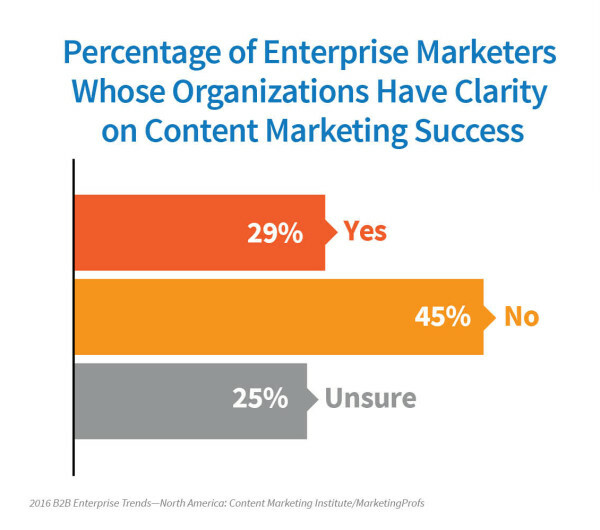 Granted, that definition varies by company, but when we asked the survey question, “In your organization is it clear what an effective or successful content marketing program looks like?” only 29% of B2B enterprise marketers said yes. However, when we look at the marketers who rated their companies as “most effective” at content marketing, 64% said they know what success looks like. My take: Just because we can publish, doesn’t mean we should. It’s clear that most enterprises around the world just started publishing in multiple channels because they can, without any clear indication of the organizational goals behind it. This is one of those times when we really need to stop and look at what we are really producing … and why. When everyone on the team knows what’s going on, odds are they’re going to be more successful. 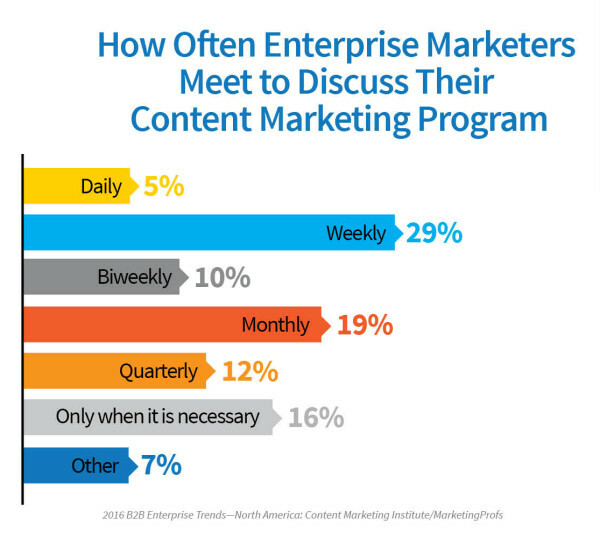 Our research shows that 34% of enterprise marketers meet daily or weekly to discuss the progress/results of their content marketing program (and 49% said that meetings were valuable, regardless of frequency). However, 58% of the most effective said they met daily or weekly (and 73% said that meetings were valuable, regardless of frequency). My take: For a content marketing approach to work well, it generally coincides with a cultural change. Content marketing is not more difficult, just different than what we’re used to doing. That means, if anything, we need to over-communicate. Here I go again. I can’t stress enough how important a written strategy is. Our research showed that 35% of enterprise marketers have a documented content marketing strategy (up from 31% the prior year). However, 75% of the most effective have taken this important step. Almost all of the remaining 25% have a verbal strategy and I hope they’re in the process of documenting it. My take: Write it down, review it often. Write it down, review it often. Again, this is not rocket science, but we know what works here. If you aren’t doing this, start doing it today. 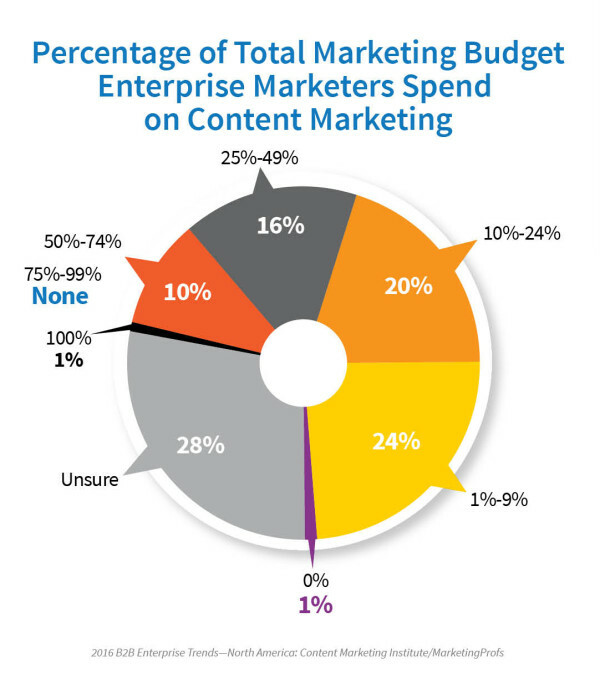 Enterprise marketers allocate 25% of their total marketing budget (on average) to content marketing (up from 23% last year). However, the most effective among them spend 36% (on average) of their total marketing budget on content marketing (up from 31% last year). My take: What’s more fascinating about these numbers isn’t the amount spent from those who are more effective, it’s the amount spent by those that aren’t. Just … wow. With any type of marketing, if the approach works, we generally will spend more. If it doesn’t, we generally spend less. If you think you need a bigger budget, focus on where you can make a critical impact with your audience instead of focusing on so many areas at once. As I said earlier, there are a lot of things that enterprise marketers are getting right. But, to be honest, there is so much potential for enterprises with the approach of content marketing. It’s time that we start looking at this approach as critical to the organization and treating it that way, instead of something we do on the side. The numbers, as we see them above, still make it clear that content marketing has not risen to the top of the charts (at least not yet). On a parting note, this is the final report we’ll be producing from the last annual survey. If you’re a CMI subscriber, please watch your email box for an invitation to participate in our next annual survey and watch for new research findings beginning in the fall. This data is so important to helping us create a stronger content marketing industry, and we really appreciate the time that everyone takes to participate. 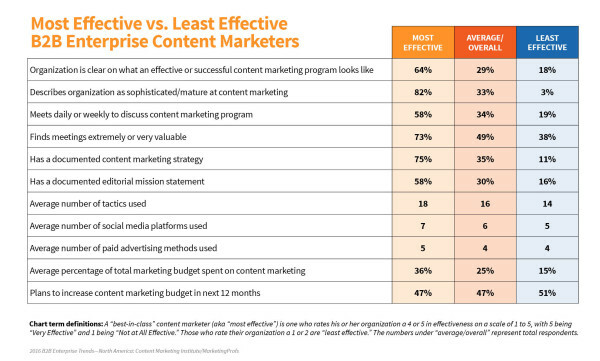 If you’re an enterprise marketer, is your organization becoming more effective with content marketing – or less? Or maybe you’re stagnant. Tell us why in the comments. For more insights into how enterprise marketers approach content marketing, download the report. You’ll learn about their goals for content marketing over the next 12 months, the metrics they use to measure success, their top priorities for internal content creators, challenges, and more.